Commonly encountered seabirds include shearwaters, storm petrels, and boobies, but the birds that are affected most by longline gear are albatrosses and petrels. Albatrosses and petrels can live for over 60 years and lay only one egg every one to two years. This means that any birds killed have an impact on the population. They also generally mate for life, and one bird’s death means that its partner may never reproduce again. There are 22 species of albatross; 17 are threatened with extinction. Albatrosses fly thousands of kilometers on a single feeding trip, mostly in cooler, higher-latitude waters, although many are globally distributed. 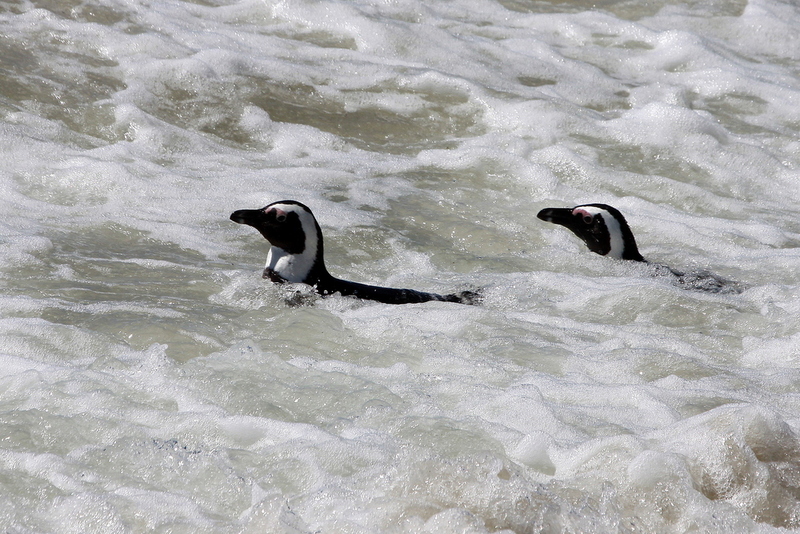 But other seabirds are in warmer waters or specific to a region. In the next section, we cover the major types of seabirds. It is important to at least attempt to identify any seabirds you catch. If you are unable to identify them, consider taking a photograph. Great Albatross: The great albatrosses include the largest of all flying birds, the Wandering Albatross. The wingspan of these birds surpasses 3.5 m (11.5 ft) and can weigh over 9 kg (20 lbs). The great albatross are found across the southern oceans, particularly south of 30°S but also farther north in cold water currents off the coast of Chile and southwestern Africa. Great albatrosses are typically white birds with black upper-wings. Older birds are generally whiter. Mollymawks: Though smaller than the great albatrosses, mollymawks and sooty albatrosses are still very large birds with wingspans of around 2 m (6.5 ft) and weigh about 3-4 kg (8 lbs). These species have two small nostrils on the side of the bill. Many species are distributed across the southern seas, with three species in the North Pacific. 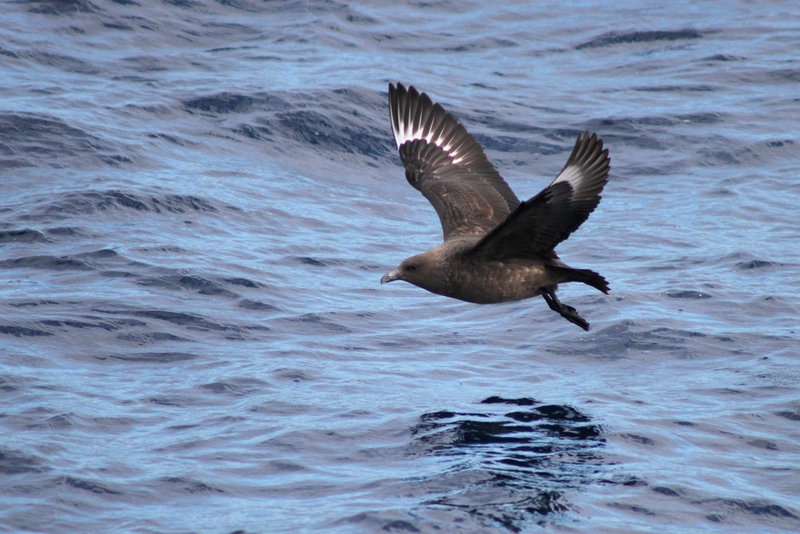 Petrels and Shearwaters: Petrels and shearwaters are a diverse group of seabirds. Many species travel vast distances on annual migrations. In contrast to the albatrosses and petrels, which tend to migrate east and west following air currents in temperate waters, some shearwaters migrate north to south, from pole to pole, such as the short-tailed shearwater in the Pacific. Most species have a wingspan of around 1 m (3.3 ft) and weigh as much as 1.4 kg but typically less than 1 kg (2.2 lbs). All species have a tube along the top of the bill. Many species are totally dark, while others have a mix of gray and white feathers. Giant petrels: Giant petrels are as large as the mollymawks and can weigh as much as 5 kg (11lbs). These large petrels have a prominent, large tube on the top of the bill and are dark-colored, with gradually lighter gray shading as they age. There is a white version found in about 10 percent of the population. Giant petrels are scavengers and will go after offal (fish parts such as heads and guts) discards. They are found in the southern ocean (typically below 30°S). Penguins: Penguins are flightless seabirds. They are unmistakable at sea, typically surfacing only for short periods before diving again. They are found in the Southern Ocean, and also around South Africa, New Zealand, and the coast of South America. Gulls: Gulls are typically associated with coastal waters and have broader wings than petrels. Gulls lack the tubes on the bill that albatrosses and petrels have. Storm petrels: Storm petrels are the smallest of the seabirds, weighing only 50 g (1 – 2 oz) or so, and can be found across all oceans. Storm petrels have dark coloring above and white or dark below, often with a white rump. These little birds flutter just above the sea surface with their long legs dangling in the water as they filter-feed on small plankton, organic particles, and oil droplets. Boobies and gannets: Boobies and gannets are medium-sized seabirds with extremely pointed heads and bills, heavy bodies, wedge-shaped tails, stout legs, and long, slender wings. These birds perform impressive plunging dives from great heights to capture small fish near the surface. These birds are found mainly in tropical and subtropical waters. Skuas: Skuas are similar to gulls in appearance, but larger, and have dark feathers with white patches on the wings. These birds can be found far out to sea but typically in lower numbers than the petrels and albatrosses.